Around the age of 16. My family went on a trip and even though my father was skilled in photography, I somehow got the task of making photos. I had always been interested in art growing up, mostly drawing and painting. I was good at rendering and I could replicate just about anything in terms of realism but I didn’t have much of an imagination. That’s when I realized photography might be a good fit. I still had to be creative, but the material to work with was already there. By my senior year, I knew I wanted to continue with photography, so that’s what I did in college. "Interstate 26, near Mars Hill, North Carolina"
Did your work change over time? Yes. I hope my work is always changing for the better. Over the years my aesthetic has definitely shifted depending on the project and the message I’m trying to communicate. I think it’s important to develop a personal sensibility and style, but I also believe that one should be willing to expand and adapt over time. Also, as the social and political climate changes, I feel like my work necessarily changes because certain issues become more important and other things fall to the side. I am always on the lookout for long-term projects, something I can really stick my nose into and learn more about. I don’t know that I have a specific methodology for choosing subjects, but I have to see a lot of potential in something in order to justify the investment of time, energy and money. 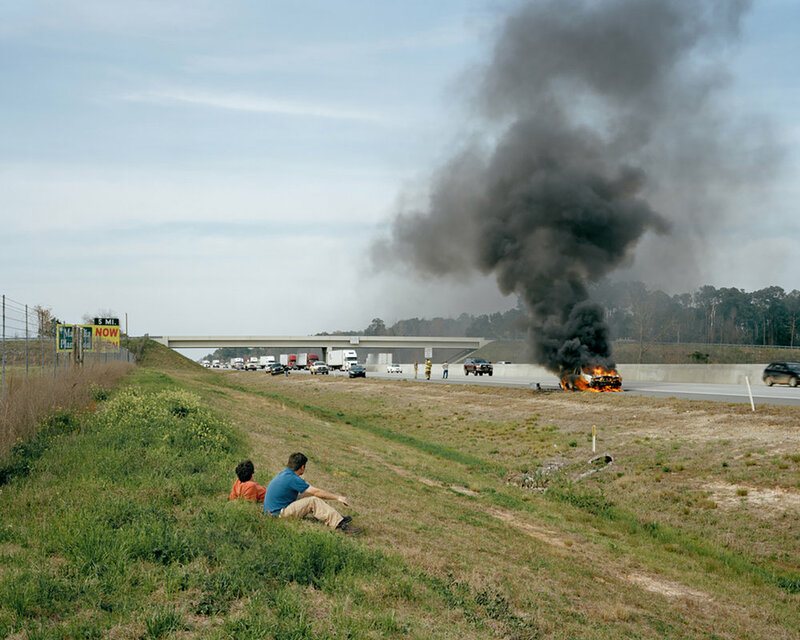 For the past last seven years I have been researching and photographing the periphery of America’s highways. Not the back roads or scenic routes, but the big, ugly interstates and superhighways. I went on my first cross-country trip when I was 19 and since then traveling by car has been an important part of the way I see, understand and photograph the American landscape. I wanted to confine myself to the road and its immediate surroundings to examine how our infrastructure can be a reflection of economic, social and environmental issues. All of the photographs in this exhibition are taken from that project, Somewhere Along the Line. How did you make your selection for this exhibit? I am not originally from the South, but I have lived here for the past 12 years. The South has a very distinctive identity, perhaps more so than any other region in the country, but it’s one that I often find troubling because it is so intertwined with its own history. I think it’s healthy to question traditions and to be critical in any work of art so I try to do those things whenever I can. If I can make a picture that riffs on certain tropes or stereotypes while at the same time revealing something unexpected or new, I would consider that a success. But in general, I’m definitely interested in what the South looks like now and how that might differ from a more idealized version of its past. Take for example the image made in Dallas, Texas where the construction of the interstate becomes entangled with the skyline. We have a pretty iconic view of downtown, which has been cultivated and considered over many years and has become part of that city’s identity. But then we have the highway, which is built for function and economy, and given far less consideration in terms of aesthetics, yet it has come to dominate the scene presented and in time will completely overwhelm the specificity of that particular place. These big roads create a uniformity and an anonymity that is seemingly at odds with what we commonly refer to as place so what happens when those things collide? "Interstate 40 near Morrilton, Arkansas"
What else can you say about what the South means to you? I don’t have this romanticized image of the South in the way that I think many Southern artists do. But then again, I don’t think I really have a romanticized view of America in general. I look out at this great big country and I see a place of aspiration and contradiction. For instance, the image taken along Interstate 40, just outside Morrilton, Arkansas. 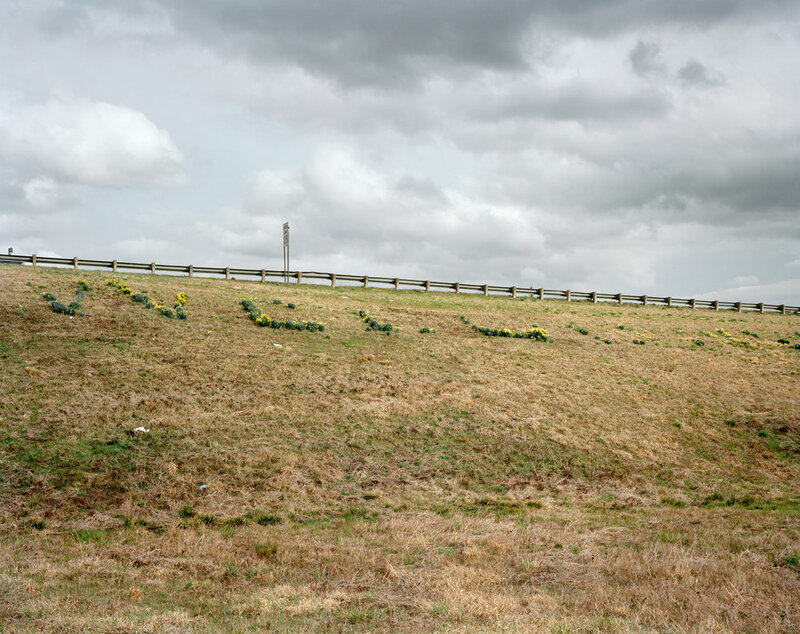 There are flowers planted near the guardrail that once upon a time spelled out the word Welcome, a common sentiment of Southern hospitality, and I’m sure one that was well-intentioned. But in my picture, the flowers are all but decimated so the original message has lost its potency, mirroring the reality that many in fact do not feel welcomed here. As an artist I feel a responsibility to show the reality of what I see and feel, and that usually means being critical in some way. But that doesn’t mean that the photographs can’t also be celebratory; in fact, I think the best pictures are both. Ultimately, it’s up to the audience to look beyond the formality of the pictures and interpret them as they see fit. Hopefully I’m able to communicate some of my thoughts and feelings but if someone has a different interpretation, that’s ok, too. That’s the nature of the medium. Well, I am working towards publishing a book about my last project, so that is pretty big. And I’ve just started making new photographs in Clarkston, GA, commonly referred to as ‘the most diverse square mile in America.’ The amount of diversity and multiculturalism is really astounding and I thought it could be interesting to see this part of the deep South represented by all these different nationalities, ethnicities and religions. Last but not least, who do you collect? Honestly, I can’t really afford to collect photographic prints, but I do buy books whenever I can. There’s so much great work being made right now, and we’re seeing more and more images from underrepresented artists and new voices, so it’s an exciting time to be active and engaged.